'Still Is Our Land', watercolour, 75 x 51 cm. This is the third and final painting in the commissioned series of Glen Banchor above Newtonmore in the Highlands of Scotland. This is the glen in the present day and we're looking west into the sunset over the mountains. The man is sitting on the remains of the fourth building from the right in 'Our People', and the diagonal wall feature in the middle distance is also visible on that painting. 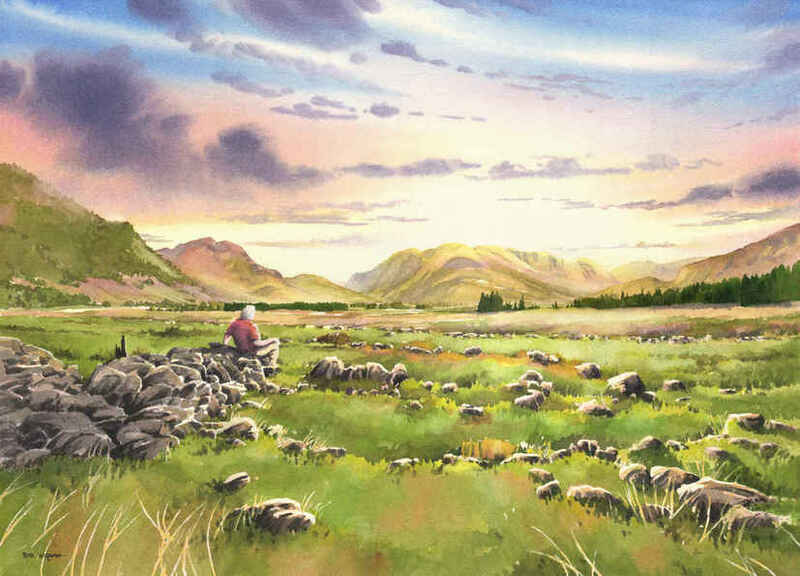 You will gather that there is some significance to this man being here in the painting, and he may well be recognised by Clan members (and certainly many people in Newtonmore!) but I'll say no more here as his presence is personal to the painting's owner. Whilst I have used a degree of artistic license here, the rocks are in the places they lie today, the ruins of someone's home. The double-meaning in the title was intentional.